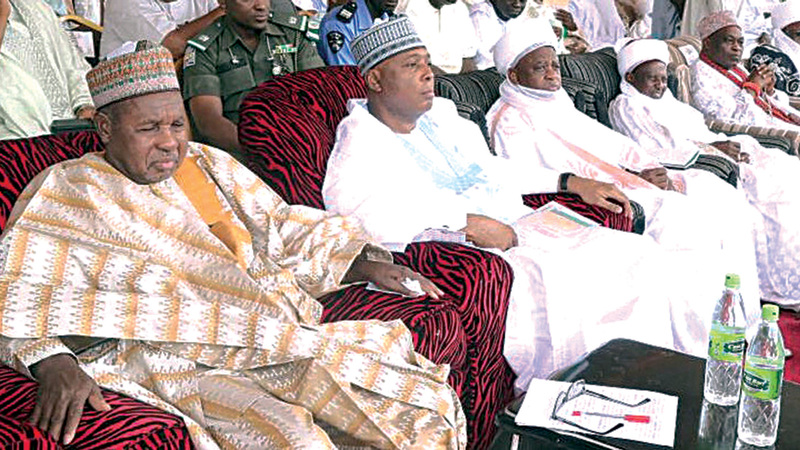 Governor of Katsina State, Aminu Bello Masari(left); President of the Senate, Dr. Abubakar Bukola Saraki, Sultan of Sokoto, Alhaji Sa’ad Abubakar III and other dignitaries during the presentation and launch of books on the biography of the Emir of Gwandu, Maj, Gen. Muhammad Ilyasu Bashar, in Kebbi State, yesterday. The national leader of the All Progressives Congress (APC) Bola Tinubu and Senate President Bukola Saraki surprised guests, yesterday. After shaking hands at a book launch in honour of the Emir of Gwandu, Alhaji Muhammadu Illiasu Bashar, the two went into a secret meeting, which lasted about an hour. Tinubu and Saraki have been at daggers drawn over political differences.Tinubu, who arrived the venue, Waziri Umaru Federal Polytechnic, Birnin-Kebbi, alongside Governor Abubakar Atiku Bagudu and Governor Aminu Masari of Katsina State in a Toyota Coaster at about 10:30 a.m., were seated before Saraki arrived in a separate vehicle. A mild drama played out as Saraki went straight to greet Tinubu, who was seated beside Bagudu, causing a stir in the crowd. Tinubu stood to greet him. This was followed by a tête-à-tête. Sultan of Sokoto, Alhaji Saad Abubakar, in his remarks, charged all Nigerians to embark on projects that would strengthen the unity of the country, even as he commended the attendance of different personalities at the event, irrespective of their religious faith. Saraki, who was chairman of the occasion, said he attended the book launch because of the relationship between the people of his constituency and Gwandu emirate. He commended the late Emir of Kano, Alhaji Ado Bayero, for initiating the writing of books to foster understanding and knowledge in the country.